Copy the picture you want to insert as the polaroid, but do not paste it yet. Turn off the top three layers that serve as an intro to the PSD. Open the “Polaroid” layer set, and find the layer with the current image in it (should be the fourth one), click it. Paste your new image in. It should appear as a new layer above almost everything, but below the polaroid. If not, move the layer around until it does. 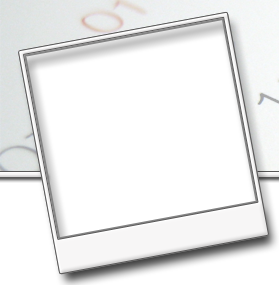 You may wish to rotate your picture layer to make it appear straight inside the box. This is kind of a “tweak it till it’s right” step. Now Ctrl + Click on the vector mask (the little grey looking box next to the actual preview) of the old polaroid picture layer. This should load up a selection of the outline of the inside of the polaroid. Hopefully you can get the step in correctly, it’s the tricky/important one. Finally, making sure that your new polaroid picture layer is still selected, click on the “Quick Mask” button at the bottom of the layers palette, should be the second one from the left, a grey box with a white circle in the middle. Save the file you have just edited. Go File > Jump to ImageReady. Photoshop will now open up ImageReady with your file. In the toolbar, select and hold the Slice button (looks like a knife) until other buttons pop up, then select the Slice Select button (looks the same, but with an arrow). Select the slice that contains the polaroid. You should only have to click on it. Go File > Save Optimized As, and change the bottom drop-down to “Selected Slice Only”. Then save it where you want! And that’s it, you should now be set. I would highly encourage you to learn Photoshop, if you have it at your disposal. You will be a better webizen for doing so. Good luck! All these manual steps drove me nuts when I wanted a slew of polaroid images for my random selector. That is why I split out the polaroid frame and wrote a Python script to take 205×195 JPEGs and wrap them in the polaroid frame. The post has a link to the script. With current versions of PHP with GD it would be easy to do this in PHP but my ISP didn’t have a version of GD that supported PNG alpha channels correctly then. They since upgraded. I really like this skin, I used it when my friend asked me to make a blog for him. (http://onepointzero.fw.hu) My only problem with the skin is that it misses the “Previous entries” link to previous pages of blogs. Why is that? Anyway, thanks for the skin – great idea! I am somehow too stuip to find the PDS for downloading on this site. Can you help me? Hiya – I have a different question about the site and I’ll probably feel stupid when I hear the answer – but I cannot figure out where to edit the bit that says, hi my name is Traveler, etc. please tell!! I was unable to extract the .zip file that contains the psd files. I downloaded the .zip from the link on your site. Yes, the travelogue_psds.zip is damaged (it is only 667.648 bytes). Can you replace it and send me a notice please? Thanks! Please let me know if/when the psds will be fixed. I would love to use this theme. It will tell you to download it. The PSD has been reuploaded, ya’all can download it now. Melissa, glad you like the look! You will need to modify (preferably) the Photoshop file, or edit polaroid1.jpg and header1_img.jpg (much more difficult). Or perhaps you are talking about getting an actual picture in the polaroid? If so, make sure you put your resized images in the randimages folder of the theme. If that is not working, send me a link so that I can troubleshoot. Hi, Joshua. Love your theme. I resized some photos and put them in the randimages folder. They showed up for a short time, but now they don’t. Can you tell me what might be wrong? Sandra, change line 19 of header.php to be rotatorm.php instead of rotator.php. I’m not sure why, but some people have troubles with the original rotator script, but I tried the second script (rotatorm.php) on your server, and it pulled up the images just fine. Let me know how it goes. Terrific! That fixed it. The dates are incorrect on my posts, though. How do I fix that? The date shows up correctly on the settings page. Weird. Date is correct now — used to say the 9th, now says the 6th. Didn’t do anything to change it — very strange. I’ve uploaded some photos to randimages folder but they won’t show up. I tried the script edit you suggested to Sandra but that didn’t work. Other suggestions? I’m using the Travelogue theme on my blog and like it a great deal. But I’m having great difficulties with the random photos in the header. Looking at the instructions, I’m afraid I’m none the wiser. To begin with: where do I find the folder called “randimages”? Everyone with questions about the randimages folder, the polaroid, or many other Travelogue theme-related questions, I just put up a post hoping to answer a lot of these, check it out at this Travelogue post. Hope that helps!